“Catered to You” is a very strange name for a program, but it is one you might encounter unexpectedly. Although this advertisement-supported program is unlikely to enter your operating system illegally, you might install it by accident. This adware, in most cases, comes bundled with third-party programs, and you might overlook Catered to You when installing other, more attractive applications. Of course, you might have to delete programs even if you install them yourself. Do you know if you need to remove Catered to You from your computer along with other unreliable programs? Continue reading to find out. Our research team has found a website representing Catered to You, cateredtoyousoftware.com. This site does not provide an installer for the suspicious advertisement-supported program, and its only function is to introduce users to the supposedly beneficial program. This has not surprised us because we knew right away that Catered to You is a clone of High Stairs, Wander Burst, Dragon Branch, and similar ad-supported programs that are represented in the same way. Of course, we recommend removing these ad-supported programs. All of these programs were created using the Injekt engine, and we have found that this engine can be employed by unreliable parties who want to create seemingly harmless programs to exploit security backdoors. This is one of the most important reasons to delete this adware from your PC. As soon as Catered to You finds its way into your operating system, it starts displaying pop-ups, shopping deals, and other kinds of online offers. Because the creators of these advertisements are unknown, there is a great risk of being scammed. In the worst case scenario, malicious schemers could use harmless-looking ads to expose you to clandestine scams and even malware, which is why removing Catered to You is so important. Although we cannot say that all computer users will face the same issues, you cannot forget that you might encounter serious security issues if you do not delete this infection. It was found by our researchers that Catered to You can be uninstalled via Control Panel. 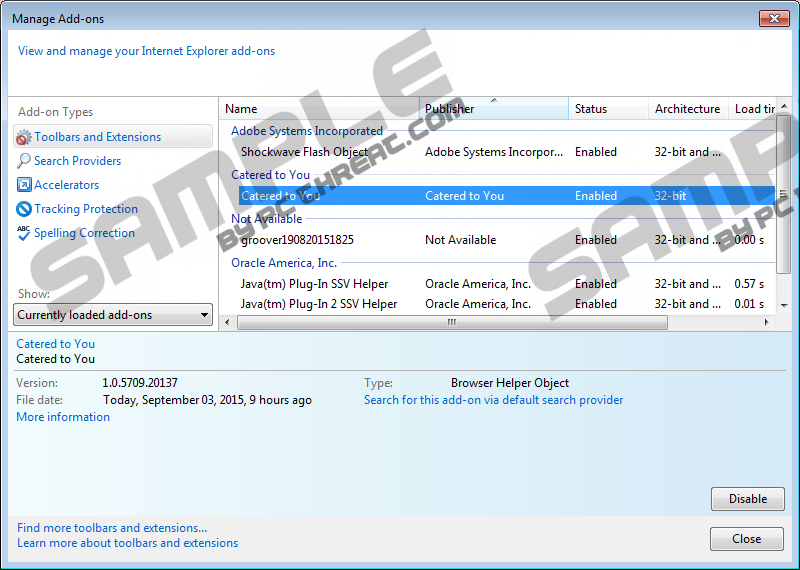 The instructions below were created to show you how to access the uninstaller of the undesirable ad-supported program. Once you are done uninstalling this adware, it is essential for you to run a malware scanner to see if all files and components associated with it were eliminated. If you find that you need to delete Catered to You leftovers, make sure that you do this as soon as possible. Of course, it is very likely that the scanner will find third-party infections that also might require immediate removal. As mentioned previously, an official Catered to You installer does not exist. Instead of distributing this ad-supported program in a transparent manner, its creator has decided to trust third-party distributors, and they might be very unreliable. In most cases, unreliable ad-supported programs travel bundled with hijackers, Trojans, potentially unwanted programs, and other kinds of suspicious, potentially dangerous software. Computer experts might be able to find and remove all malicious programs manually, but they are smart enough to understand that automated malware detection and removal software can perform the task much quicker and better. We suggest installing this software, especially if you are inexperienced. Locate the undesirable application, click it once, and select Remove. Locate the application you want to delete, right-click it, and select Uninstall. Access the Metro UI and open the Charm bar from the bottom-right corner. Click the Search icon, enter Uninstall a program, and launch it. Go to search box on the Taskbar and enter Control Panel. Open the menu and select Uninstall a program. Right-click the app you want to delete and click Uninstall. Quick & tested solution for Catered to You removal.